Looking for a new wood dining table? Make sure you get the right wood table for your space and needs. Here’s how. Wooden dining tables can trace their roots back to the medieval era where they were used as community dining tables. Since then, wood dining tables have made their way into our homes and our hearts. Often made of sturdy hardwood, these tables are guaranteed to be the center of your kitchen and home for years. Whether you’d like a 4, 6, or an 8-seater table, our collection of the best dining tables here at Gallerynine5 is sure to have just what you need. Choosing the best wood dining table depends a lot on the size you need. For small apartments, small dining tables are a great option. If you have a big family and love to have friends over frequently then you should go for a large, modern wood dining table. Your wood dining table will provide both aesthetic beauty and functionality in your kitchen or dining area. When selecting a wood dining room table, check that it can cater perfectly to all your family members. If you have a family of 6, look for kitchen table sets for 6. A solid wood dining table is long-lasting and easy to maintain so long as you don’t compromise on quality and craftsmanship. Here are a few more considerations to help you choose the perfect table for your home. Size - The size of your wood dining room table is predominantly determined by the space you have for it and the size of your family. Your solid wood dining table should not take up all of the available space, even if it looks really good! Make sure that you have some free space around it. Style - The style of your kitchen table should be in tune with the style of your kitchen. Your table shouldn’t stick out like a sore thumb. There are different styles available for a modern wood dining table. Choose the one that works well with your existing kitchen design and is the right size and shape. Material - A wood dining table is made from strong, sturdy wood that can last for decades. They are usually low maintenance and easy to clean. They are also some of the most trusted and popular tables on the market. For the perfect combination of functionality and beauty, you can’t beat a good wood dining table. Color - Now you’ve decided that you need a new kitchen dining set, you’ll need to decide which color or stain you want. Wood tables can be stained in a variety of different earthy tones. Some are even painted or distressed. Finally, a perfect brown wood dining table, made by: Zinus, a wonderful home décor fine accessory. Made with the finest wood, dimensions: 56x29.5x29. 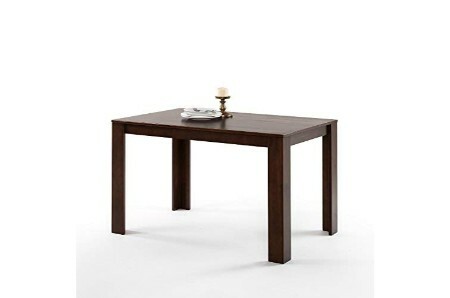 Buy it now, top rated modern dining table, now on sale, very affordable! White wood dining table, manufactured by Zinus, model: OLB-DT-5524W. Made with prime wood, luxury classy dining table, must have living room accessory, size 55x24x29. If you are like us you've always dreamt on having this retro dining table. If you are like us you can't get enough of this brown wood dining table, made by: Zinus, revives your style, a beautiful dining room accessory. Made of wood, dimensions: 45x28x29. 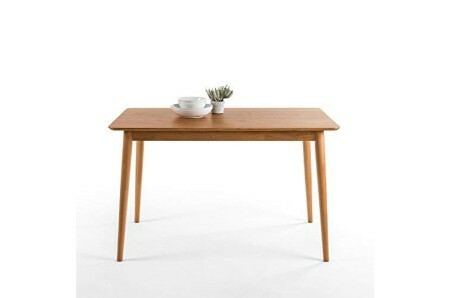 Least expensive cost for mid-century dining table. An awesome natural wood dining table, brand: Zinus, a beautiful kitchen accessory. Material: the highest quality of wood, size: 47.2x29.5x29. 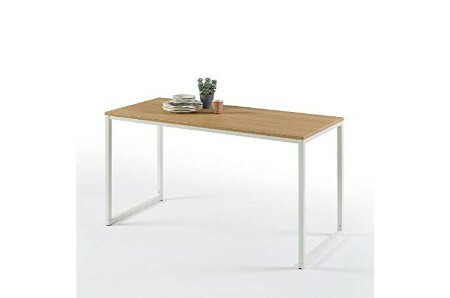 Now on discount modern dining table, this will put a smile on your face every morning. Wood dining table, made by Zinus, model: OLB-DT-MS47. Made with high quality wood, a delightful home décor adornment, dimensions: 47.2x29.5x29. Get ready for this premium modern dining table, this will put a smile on your face every morning. The best natural wood dining table, manufactured by Coaster Home Furnishings, a heavenly living room masterpiece. Made of supreme wood, dimensions: 29.50x47.25x29.75. Get a great deal for shabby chic dining table, astounding and remarkable. Brown wood dining table, created by Inside + Out, a must have dining room design piece. Made of the finest wood, size 59x35.5x30.87. Top of the line modern dining table, look's incredible! Dark oak wood dining table, created by WE Furniture, model: AZW60HDO. Made with wood, on sale, the best dining table, a superb kitchen accessory, dimensions: 38x68x30. Get the most out of this retro dining table, incredibly fun and stylish! Light brown wood/metal dining table, made by: Better Homes & Gardens, model: BH15-084-299-03. Material: wood/metal, discounted dining table, revives your style, a beautiful home décor fashionable piece, dimensions: 62.5x35.5x30.2. Add a splash of color to your day with this white wood dining table, created by Zinus, a heavenly living room design piece. Made with top-level wood, size: 45x28x29. Least expensive cost for 70's dining table, what a marvelous table! Experience an adventure with this brown wood dining table, made by: North Field Store, a heavenly dining room accessory. Made of fine wood, size 60x30x30. Now on discount, retro dining table, it’s an amazing décor item! Wood dining table, made by Better Homes & Gardens, model: BH16-084-299-01. Made of wood, top of the line fine dining table, dimensions 58.5x35.5x30. If you're looking for a really unusual idea, check out this dining table, incredibly fun! The super best rustic brown wood dining table, by Nathan James, upgrades your style, amazing home décor design piece. Made with the finest wood, dimensions 42.9x40.1x30.1. 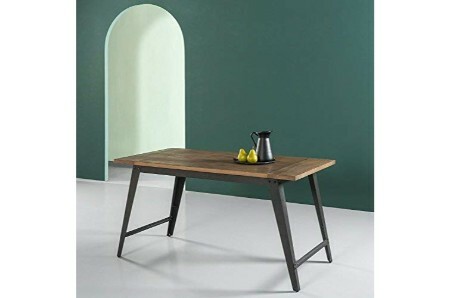 Top of the line modern dining table, amazing and affordable unique piece! Get ready for the best white wood dining table, made by Zinus, a beautiful living room elegant piece. Made of the finest wood, size 60x36x29. On sale, the best retro dining table, it's absolutely stunning and unforgettable. Brown wood dining table, made by WE Furniture, model: AZW60MCAC. Made with wood, low price dining table, surprising dining room accessory, dimensions 35x60x30. Experience an adventure with this mid-century dining table, what a marvelous idea! This simple and understated design is the best white wood dining table, made by Zinus, a heavenly kitchen showpiece accessory. Made of fine wood, size: 29.5x29.5x29. Low cost modern dining table, astounding and remarkable. Lookin for the perfect decor idea? You found it! Check this natural walnut faux wood with walnut veneer dining table, made by GDF Studio, amazing home décor accessory. Made with faux wood with walnut veneer, size: 35.40x70.80x29.50. Black wood table, produced by UMBUZA, model: UM-1. Made with wood, this is the best price for dining table, an extraordinary living room accessory, dimensions 72x34x30. Awesome, check out this shabby chic dining table, remarkable. The best-selling woodanville 7pc set dining table, made by: Signature Design by Ashley, a cool dining room fashionable piece. Made with fine wood, size: 36Dx60Wx30.25H. Luxury modern dining table, incredibly cool! Round wood dining table, produced by Flash Furniture, model: XA-36-COTA-GG. Material: wood, discounted dining table, a sublime kitchen accessory, size 36-Inch. This simple and understated design is the best retro dining table! Brown round dining table, by Coavas, model: CO-2. Made of high quality wood, top of the line showpiece dining table, a radiant home décor accessory, size 35.4x35.4x29.5Inches. This amazing mid-century dining table, will blow your mind! The coolest brown wooden dining table, a piece by Zinus, refreshes your design, must have living room masterpiece. Made of the finest wood, size: 47x29.5x29. special mid-century dining table, it's absolutely stunning and unforgettable. Fine brown solid acacia wood dining table, manufactured by WE Furniture, model: OWTEXDB. Made of high quality solid acacia wood, refreshes your design, must have dining room enhancement piece, size 79x35x30. Incredibly cool! 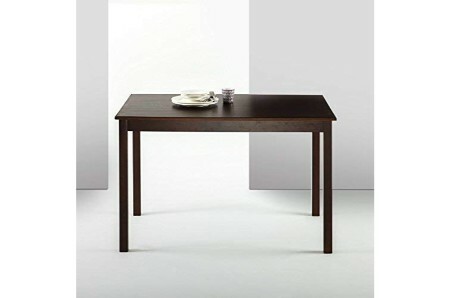 Black legs brown wooden dining table, made by: Sleekform, model: SF-SWT-M1. Made of top-notch wood, a beautiful kitchen masterpiece, dimensions: 47.2x23.6x30. If you want to add a touch of style you need this modern dining table, a great masterpiece. It is no surprise that a lot of people decide to shop for dining room tables right before holidays or fancy dinners. But before you jump straight in and purchase one on impulse, there are few factors to consider first. Let’s take a look at those now. If the dining table is to be used for special occasions, then choosing an ornate table with a delicate finish is a very nice idea. Expandable tables mean that you can create a cozy space for your family to enjoy during weeknights and then turn your table into a large one when company comes. Your personal style preferences, whether they are eclectic, modern or traditional, should inform your table choice. After all, it’s a piece of furniture you’ll use every day. Allow 24″ spacing between the dining table and wall so that people can sit down and stand up easily. Allow 38″ spacing between the table and the wall for easy movement around the table. Plan for 24″ spacing between each setting so that people can eat comfortably without hitting elbows. The maximum width of a solid wood dining table should be around 48″. The minimum width of a dining table should be around 34″ – any less and you’ll have difficulty placing serving plates in the middle of the table. If you have a fair amount of available space, base the size of the table on the number of people in your family who will sit there. Then add a few more people ‍to your count so that you’ll easily be able to accommodate guests. The shape of a dining table is just as important in terms of creating a beautiful and comfortable dining space. A rectangular dining table is the most common table shapes because of the rectangular shape of most dining areas. Rectangular dining tables are more flexible too since most come with an extension option. A square dining table looks best in a square dining room. And you can always put two square dining tables together to make a rectangular dining table for special occasions. A solid wood round dining table works best in a small square-shaped dining room. It creates a cozy and intimate scene and is the best table shape for a small group of people. An oval dining table is almost similar to a rectangular shape table, but visually it makes use of less space because of its rounded corners. Because of this, an oval dining table is the best choice in a narrow or smaller sized dining room. Many oval tables are also extendable. If you want to add a touch of style you need this black metal floor lamp, by: LEONLITE, a superb home décor masterpiece. Made of fine metal, size 65inch. The best retro floor lamp, what's not to love? a really unique deocr item. If you are a fan of art you will love this distressed black wood and metal table bench, made by Merax, amazing living room adornment. Size 40x17x14.5. now on limited time discounts, retro table bench, it’s an amazing décor item! Brown leather dining chairs, by Roundhill Furniture, model: C185BR. Made with top-level leather, now on discount, a must have kitchen elegant piece, size: 18.5x22.2x31.5. Check out this modern dining chairs, super fun and for a reasonable price. Check out this brown wood coffee table, made by: Zinus, a beautiful living room elegant piece. Made of the very best wood, size: 47x23.5x18. An affordable modern coffee table, it's absolutely stunning and unforgettable. High quality white polypropylene and wood dining chairs, manufactured by: Furmax. made with excellent polypropylene and wood, on sale, the best dining chairs, a beautiful dining room upgrade piece, dimensions 18.1x16.9x31.9. This is perfect! Black acrylonitrile butadiene styrene dining chairs, by Giantex, model: HW51953BK. Made of acrylonitrile butadiene styrene, discounted fashionable dining chairs, amazing home décor layout accessory, size: 22x18.5x32.